As well as shaping our coastline, coastal processes may also reveal evidence of the past in the form of fossils. Fossils are the remains, moulds or traces of once living organisms and some of the oldest fossils are from marine life! 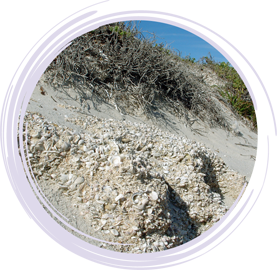 Along the coastline you may discover the remains of dead animals, such as shells, which have been buried within the rocks. However, they don’t always have to be animal remains – sometimes tree trunks and tree roots are fossilised and become visible along our coast. Try creating your own beach fossil or perhaps on your next beach walk along our limestone rocky shore, take a look at the rocks and play eye spy.